ENG: Controlling Forum Regensburg: How does Green Controlling work in corporate practice? Home /Arbeitskreis, Fachkreis, Branchenarbeitskreis, Internationaler Controller Verein, Ratgeber/ENG: Controlling Forum Regensburg: How does Green Controlling work in corporate practice? Regensburg is turning into the controlling capital of Eastern Bavaria. 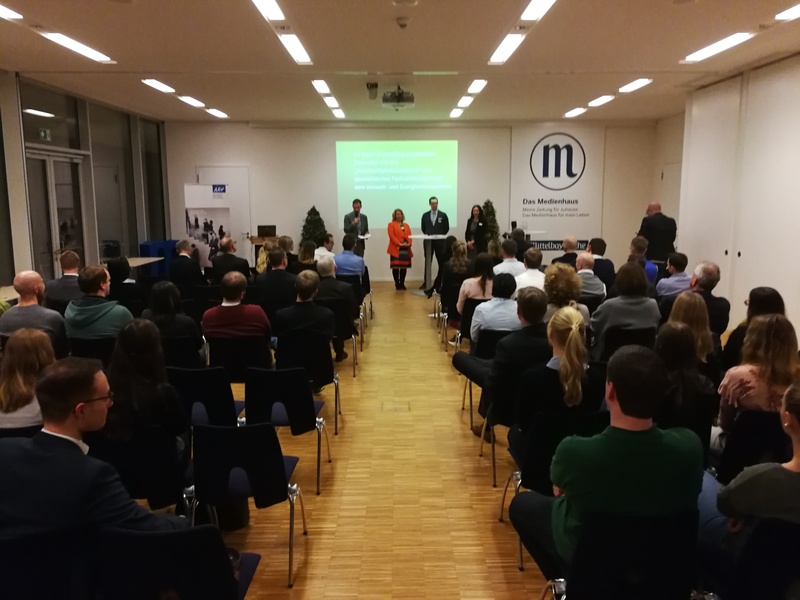 On Thursday evening (March 22) the second edition of the joint Controlling Forum of “Wirtschaftszeitung” (publisher “Mittelbayerische Zeitung”) and International Association of Controllers (ICV) took place there. 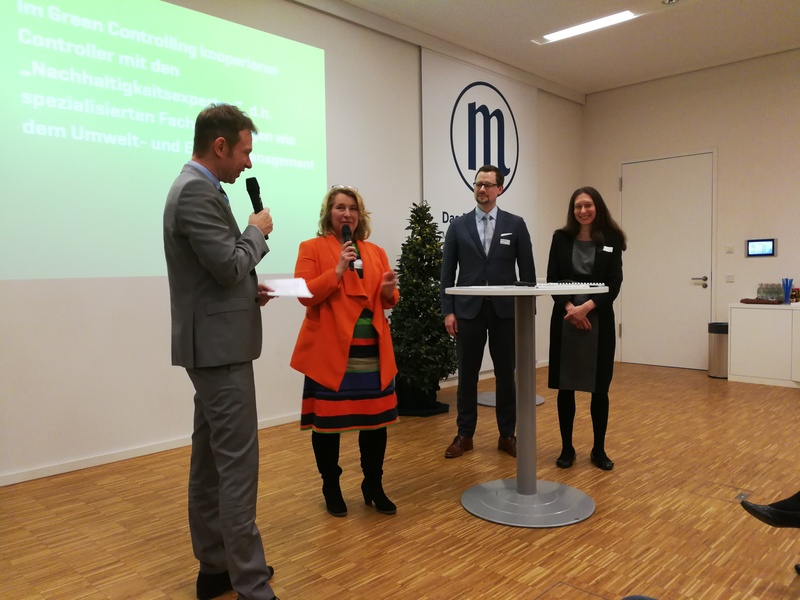 This year’s theme “Green Controlling in Business Practice” – and the brilliant experiences from the previous year – had attracted around 90 guests to the publishing house despite adverse weather forecasts. Their expectations were once again perfectly fulfilled: with top-class speakers and perfect organization. A short, pointed introduction to the topic was given by the head of the expert work group “Green Controlling” in the ICV, Dr. Alexander Stehle. At the center were the 10 theses on the Green Controlling of his expert WG (fig.). Incidentally, the expert work group had previously held its meeting also in the publishing house at the publisher’s invitation. The “Strategic Sustainability Management at Flughafen München GmbH” presented in the following main lecture Dr. Ing. Monica Streck, Head of Strategic Sustainability Management at FMG, and Vera Stelkens, Deputy Head of the ICV expert work group “Green Controlling” and member of the strategic sustainability management team of FMG. Vera Stelkens is also responsible for the development of FMG’s CO2 strategy. The speakers showed that the strategic sustainability management of their company initially focuses on identifying key issues of sustainable development and systematically integrating them into their corporate strategy. This is a prerequisite to be able to manage the company with 9,000 employees in the group holistically in the triad of economy, ecology and social issues. Out of five strategic action areas, 22 key topics were identified and from them, 80 initiatives were derived. Sustainability is an integral part of operationalization. Incidentally, the entire management framework contains 43 key figures. The speakers emphasized that financial and non-financial key figures have different “entrepreneurial mandates”, but both have management relevance. At the same time, the speakers are convinced that the trend is towards transparency and the equivalence of financial and non-financial data. Many other interesting things were to be experienced in the thrilling presentation. For example, about the ambitious goal of FMG to operate Munich as the first German CO2-neutral airport by 2030. Also on the customer satisfaction as a central topic – since 2016 the Munich airport is first and only five-star airport in Europe. The audience got the opportunity to ask questions during the following panel discussion. The ICV Regional Delegate South, Claudia Maron, who has been working for DATEV eG in Controlling and Accounting since 1989 and has been head of the Governance Department there since February, was also called to the podium. Claudia Maron was able to report in some answers from her own experience, having won the Green Controlling Award of the Péter Horváth Foundation and the ICV with her team in 2016. 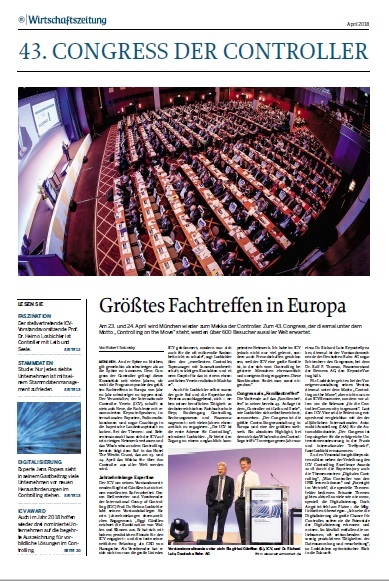 Just in time for the Controlling Forum, the host publisher presented a corresponding edition of the “Wirtschaftszeitung” again this year. In it, a 20-page controlling supplement with numerous topics and experts of the ICV, which had been worked out together in the past weeks. 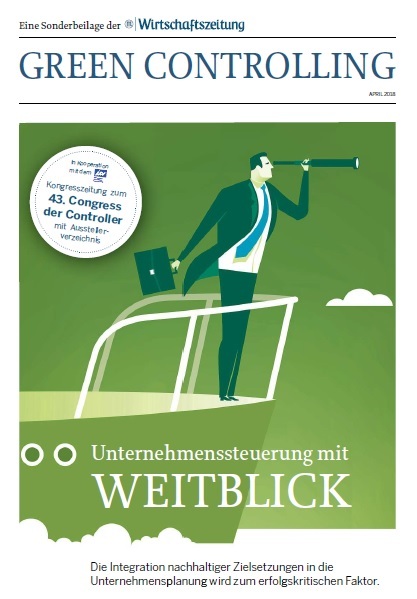 Part of this edition will be the first congress paper for the 43rd Controller Congress on April 23/24 in Munich. This newest April issue of “Wirtschaftszeitung” is online as PDF: WIRTSCHAFTSZEITUNG Controlling Supplement 04 2018 [German].